I’m constantly searching to elevate human life and the tenacity of the human spirit. Born in 1979, anGie seah is a Singaporean artist. Her multidisciplinary practice traverses the mediums of drawing, sculpture, performance art, sound and video to respond about the enigma of life. In 2000, she was awarded an education bursary from National Arts Council, graduating from the Royal Melbourne Institute of Technology’s Bachelor of Arts, with a major in sculpture. She was also awarded a culture scholarship from the Goethe Institute, Berlin in 2005. 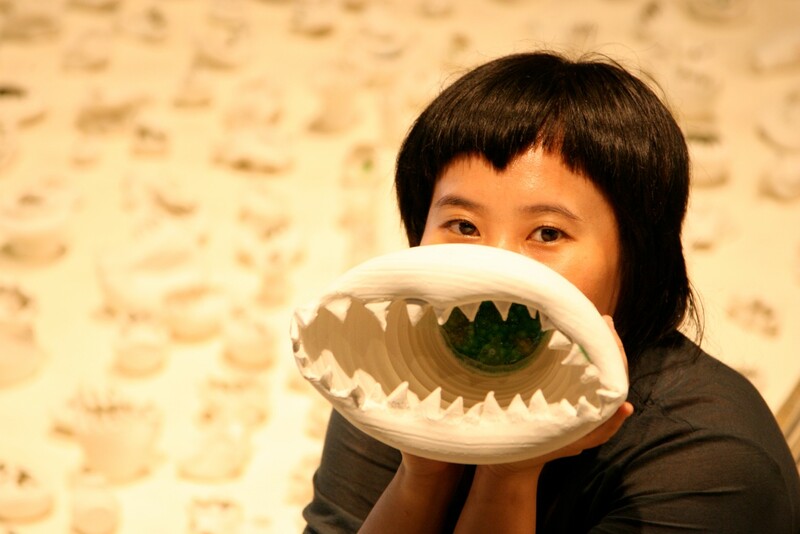 Since 1997, anGie has exhibited works, taken part in artist residencies and participated in performance art festivals in locations such as Belgium (Les Halles de Schaerbeek), Germany (ZKM Centre for New Media), Japan (Fukuoka Asian Art Museum/NIPAF), Australia (Asialink/Art Incubator/VCA), France (Cite International Des Arts/Palais De Tokyo/MAC Lyon), Poland (Galeria Labirynt), Singapore (Singapore Biennale), Sweden(Uppsala Art Museum) and Thailand (Bangkok Art Center). For a decade she has also been active in initiating art projects and participatory workshop within communities locally and internationally, conducting participatory workshops for families, underprivileged children, youth at risks, children and seniors with specials need, people with mental disorders and elderly suffered from dementia and stroke. By working within a community is a way to attain a more complete understanding of the society one lives in. It gives a chance to broaden her practice and be with the reality of life, through people. anGie seah's multidisciplinary practise explores human nature in relation to the social environment, through encounters with the ephemeral realm of sound. Her work playfully traverses the domains of drawing, performance and installation, giving form to the shapeless aural experience. anGie's intense and emotive performances evoke the complexities of the human psyche, breaking out of the limitations of spoken language in search of authentic expression and primal beauty; the unrestrained voice begins to embody a language with its own sacred vocabulary, synthesising new meanings, contexts and associations through its raw articulation. Spontaneity is a key artistic strategy for anGie, allowing chance and intuition to navigate a range of shifting emotional resonances and psychological states. She is currently developing an instinctive approach to site-specific performance that responds to her surroundings through the articulation of idiosyncratic ritual, using sound, voice and physical gestures. “No regrets for our youth” part of artist collective Dxxxxd, an Urban gym art installation presented by Aliwal Arts Centre for Singapore art week 2017. “ARTLAB" presented by Esplanade, a clay group-exhibition in Jendela Art Space, Esplanade. Singapore International Foundation 2011 for Artist Residency in Chiang Rai, Thailand.